First comes Christmas, then comes sale shopping… I do love a good bargain and with those in mind who are travelling my air this year I wanted to do a little round up of some of the beauty gems that can be found in duty free stores right now. As everyone knows if it’s bought in duty free it doesn’t count – right?! There are three little sets that are perfect airport purchases – the Clinique Moisture Set – with Moisture Surge gel-cream, spray and eye serum. A perfect trio for anyone flying who doesn’t want to arrive at their destination with parched skin. 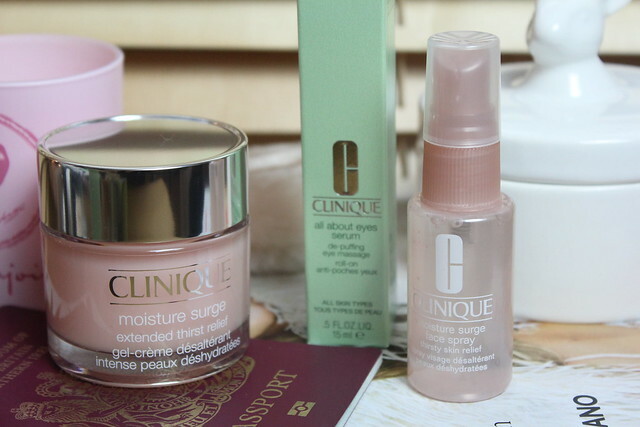 The Clinique Moisture Surge gel cream is one of my all time favourites – really hydrating but light at the same time. Finally there’s another little set that appeals to my mini-loving side, and one I always associate with travel – the DKNY Be Delicious Mini set. I picked up my first duo of these (the original green and the pink) on a holiday trip and forever have thought of them as airport purchases since. This little quad is adorable. I love the DNKY perfumes but they are too sweet for me to wear all the time, but I would love to get my hands on this little set!